Huge Savings Item! 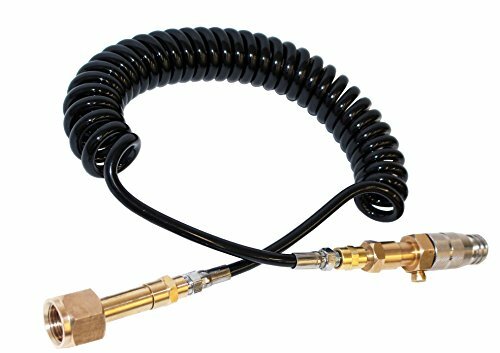 Save 11% on the CGA-320 CO2 External Tank Coil System For Soda maker, seltzer water home machine accessories. by Trinity at Three Guys Pies. MPN: TR1031. Hurry! Limited time offer. Offer valid only while supplies last. Installation video:https://youtu.be/e-Cqyqq0HN8 We are the original manufacturers of this product, your are buying directly from manufacturer. Installation video:https://youtu.be/e-Cqyqq0HN8 We are the original manufacturers of this product, your are buying directly from manufacturer. Technical Help available Monday Thru Friday 9am to 5pm Pacific time, Trinity Supply Inc 818-558-6510. CAUTION:WEAR SAFETY GLASSES AND GLOVES WHEN USING EQUIPMENT. IMPORTANT NOTE: DON'T USE SIPHON TUBE CO2 TANKS!! Our unit works with GAS CO2 only, not liquid CO2. liquid CO2 will create a bad taste in your drink. New from TRINITY , coil hose connection CGA-320 Large CO2 Tank adapter fits Most Soda Maker Beverage machines. Fits most Soda Maker Beverage machines and allows normal operation without any permanent changes. Save money on refills. This system allows you to connect your Soda marker Machine to an external Non-Siphon CO2 Tank that has a CGA-320 Outlet Valve, like 2.5lb 5lb, 20LB or 50lb commercial CO2 tanks. Our station features a coil hose system and 1200 psi rated coil hose. Hose length 26", extended 60". Note: CGA 320 tank washer included. Fits Home Soda maker beverage machine. With our adapter you can use an standard CGA 320 CO2 large Tank for instant savings on refills. Hose length 26", extended 60".